There are always Christmas movies every year, but not many Thanksgiving movies. What's Cooking is Gurinder Chadha's attempt to fix this problem not once, but four times. The movie is Chadha's ode to Thanksgiving and multiculturalism, focusing on four Los Angeles families; a Mexican, African-American, Vietnamese, and Jewish family. The purpose is to show that for all the cultural differences that exist, each family is basically the same. The effect works in varying degrees from family to family, mainly because of individual situations that sometimes border on the histrionic. Otherwise, What's Cooking follows in the tradition of movies like Woman on Top, Soul Food, and Eat Drink Man Woman as movies that sumptuously display the preparation and serving of delicious looking food. The Williams's are an upscale African-American family. Ronald (Dennis Haysbert, Love and Basketball, Random Hearts) works for the governor. He lives the yuppie life with wife Audrey (Alfre Woodard, Mumford, Love and Basketball), although their marriage is strained because of issues between them and the fact that their older son is not home. Ronald's mother is also present for the holiday, and she is the typical meddling mother-in-law. The least interesting family in director Chadha (Bhaji on the Beach) and Paul Mayeda Berges' story is the Seeligs. Rachel (Kyra Sedgewick, Critical Care, Labor Pains) is bringing home her lesbian lover Carla (Juliana Marguiles, Dinosaur, The Newton Boys). Rachel's family does not know that she is a lesbian. It is the addition of Estelle Harris (Toy Story 2, My Giant) as Rachel's very stereotypical Jewish aunt that turns the story around the Seelig family into drivel. For anyone not familiar with her work, Harris played George Costanza's neurotic mother in Seinfeld, and pretty much sticks to the same annoying formula in all her roles. The last two families are much more interesting, although their problems seem cliche. The Nguyens own a video store in Los Angeles. Matriarch Trinh (Joan Chen, Purple Storm, Precious Find) is doing all she can to raise her children to respect her culture. As with many second-generation Asian Americans, the children suffer an enormous generation gap. Her son Jimmy (Will Yun Lee) is not even coming home for Thanksgiving. He says that he is busy with school, but he is actually going to spend the holiday with his girlfriend Gina Avila (Isidra Vega, Edge City, Desert Blue). Gina's mother Elizabeth (Mercedes Ruehl, The Amati Girls, More Dog Than Bone) invited her new boyfriend over, much to the consternation of her son, who invited her estranged husband. Instead of closely examining the inner workings of one family, Chadha goes for a more superficial look at four. Each suffers as a result, since there is not enough time to fully identify with each member. Still, Chadha does a surprisingly good job of juggling stories back and forth without losing too much momentum. Interestingly enough, most of these families have strong mothers (Chen, Ruehl, and Woodard, who all do well in their roles) who hold the family together despite everything going on. As mentioned earlier, each family slowly and beautifully prepares their Thanksgiving dinners, each spiced with their own cultural touches. 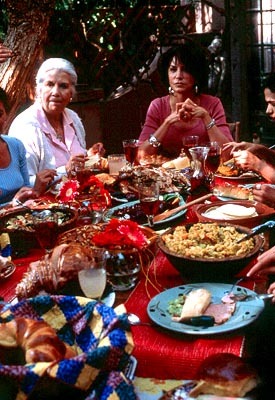 Watching the food is sometimes more enjoyable than watching the film, which slowly escalates in melodrama. The quality feels like that of a television sitcom family; they hate each other, they love each other, they eat, and everything is okay in the end. 1 hour, 40 minutes, Rated PG-13 for some sensuality, brief language, and a perilous situation.